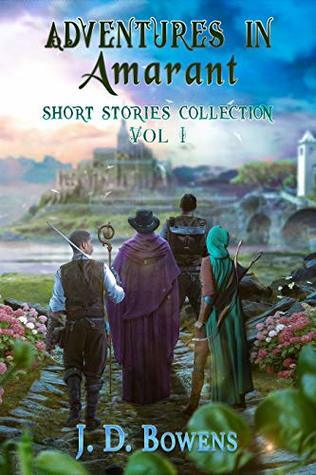 It's a collection of three stories (prequel to series): A Journey Through the Shadows, where two of the brother - Consus and Kyran follow the old priestess, on her way to the city, but the job complicates when they are chased by the soldiers. They hide in the network of caves and soon discover why former residents left the dwelling. :) The Rat, The Raven and The Crow where Ewan and Altin except a simple task of getting rid of the Rat problem in the tavern, but they soon discover, that there is more to the problem than just rats - this one was my favorite one. :) And A Bard on the Road to Sundrow. This one is a bit different. On the road, the help halfling and agree to follow them the rest of the way. But one halfling is missing his instrument and convinces Kyran to help him retire it. The writing is on point. :) I love the flow of the story. Reading books set in a fantasy world can be overwhelming because of all the info dump, of confusing if there is too little info. Adventures in Amarant are right down the middle, information about the world is revealed slowly and you feel like you're discovering the world along the brothers. :) So good.